VARIOUS Copasetic! 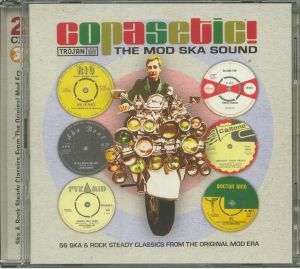 The Mod Ska Sound vinyl at Juno Records. 1. Desmond Dekker & The Aces - "007"
2. Roy Richards - "Contact"
3. Derrick & Patsy - "Housewife's Choice"
4. Baba Brooks & His Recording Band - "Guns Fever"
5. 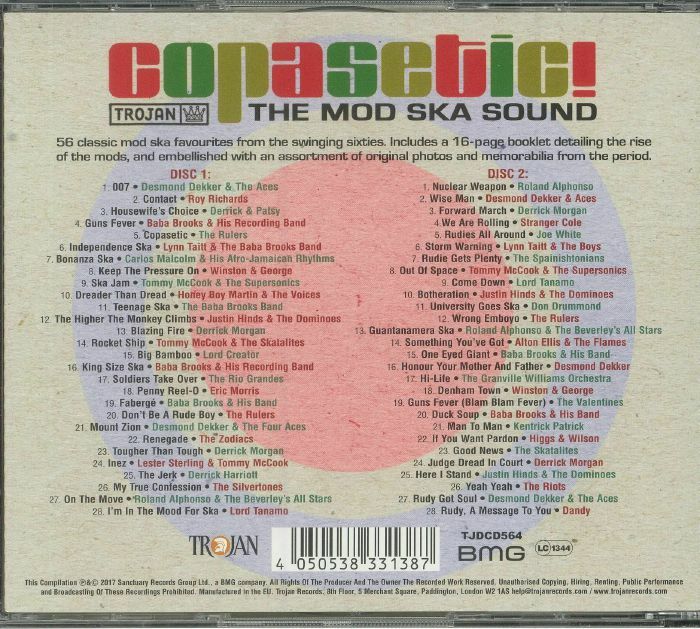 The Rulers - "Copasetic"
6. Lynn Taitt & The Baba Brooks Band - "Independence Ska"
7. Carlos Malcolm & His Afro-Jamaican Rhythms - "Bonanza Ska"
8. Winston & George - "Keep The Pressure On"
9. Tommy McCook & The Supersonics - "Ska Jam"
10. Honey Boy Martin & The Voices - "Dreader Than Dread"
11. The Baba Brooks Band - "Teenage Ska"
12. Justin Hinds & The Dominoes - "The Higher The Monkey Climbs"
13. Derrick Morgan - "Blazing Fire"
14. Tommy McCook & The Skatalites - "Rocket Ship"
15. Lord Creator - "Big Bamboo"
16. Baba Brooks & His Recording Band - "King Size Ska"
17. The Rio Grandes - "Soldiers Take Over"
18. Eric Morris - "Penny Reel-O"
19. Baba Brooks & His Band - "Faberge"
20. The Rulers - "Don't Be A Rude Boy"
21. Desmond Dekker & The Four Aces - "Mount Zion"
22. The Zodiacs - "Renegade"
23. Derrick Morgan - "Tougher Than Tough"
24. Lester Sterling & Tommy McCook - "Inez"
25. Derrick Harriot - "The Jerk"
26. The Silvertones - "My True Confession"
27. Roland Alphonso & The Beverley's All Stars - "On The Move"
28. Lord Tanamo - "I'm In The Mood For Ska"
1. Roland Alphonso - "Nuclear Weapon"
2. Desmond Dekker & Aces - "Wise Man"
3. Derrick Morgan - "Forward March"
4. Stranger Cole - "We Are Rolling"
5. Joe White - "Rudies All Around"
6. Lynn Taitt & The Boys - "Storm Warning"
7. The Spanishtonians - "Rudie Gets Plenty"
8. Tommy McCook & The Supersonics - "Out Of Space"
9. Lord Tanamo - "Come Down"
10. Justin Hinds & The Dominoes - "Botheration"
11. Don Drummond - "University Goes Ska"
12. The Rulers - "Wrong Emboyo"
13. Roland Alphonso & The Beverley's All Stars - "Guantanamera Ska"
14. Alton Ellis & The Flames - "Something You've Got"
15. Baba Brooks & His Band - "One Eyed Giant"
16. Desmond Dekker - "Honour Your Mother & Father"
17. The Granville Williams Orchestra - "Hi-Life"
18. Winston & George - "Denham Town"
19. The Valentines - "Guns Fever (Blam Blam Fever)"
20. Baba Brooks & His Band - "Duck Soup"
21. Kentrick Patrick - "Man To Man"
22. Higgs & Wilson - "If You Want Pardon"
23. The Skatalites - "Good News"
24. Derrick Morgan - "Judge Dread In Court"
25. Justin Hinds & The Dominoes - "Here I Stand"
26. The Riots - "Yeah Yeah"
27. Desmond Dekker & The Aces - "Rudy Got Soul"
28. Dandy - "Rudy, A Message To You"